"Charlie Engle Runs for His Life . . . Once Again"
"How a coke addict-turned-ultramarathoner became a prison hero"
"They call themselves the ICEBREAKERS"
"Their goal: Break the ice of talking about a once-taboo subject so other sufferers might find help. The team members -- 6 accomplished ultra marathoners -- were hand-picked by leader Charlie Engle." "It’s early morning and I’m hunting for quarters . . . We’re in the heart of coal country. The corner diner isn’t open yet. The “Only Creole Restaurant in West Virginia” isn’t open yet. City Hall isn’t open yet. I'm looking for quarters because I'm headed to prison, and I've been told they will be useful there. I'm going to see a man named Charlie Engle. Charlie is a cat of many lives: once-upon-a-time crack addict, father of two, professional repairer of hail damage, TV producer, motivational speaker, documentary-film star, and—for the past twenty years—one of the strongest ultra-distance runners in the world." "When one spends 111 consecutive days of his life running across the Sahara Desert, there is time to think. Lots and lots and lots and lots and lots of time to think. So that's what Charlie Engle did. He thought about . . . a large, icy Pepsi . . . his two sons . . . his boyhood in North Carolina . . . Johnny Cash . . . the Tar Heels . . . a cool shower . . . "
"My suffering in the Sahara and the Amazon Jungle and all the different places I've run, they're all 100 percent voluntary," says Engle, who's competed in the Badwater Ultramarathon, the Eco-Challenge, and the 155-mile Gobi Desert March . . . "I'm there because I had a crazy idea and enough money to give it a shot. But nothing in the world compares to the deprivation and humiliation of my addiction. There's no pain in running that comes close." "If Oprah were still doing every day TV . . . ( RUNNING MAN ) would be the next book in the OPRAH BOOK CLUB!" 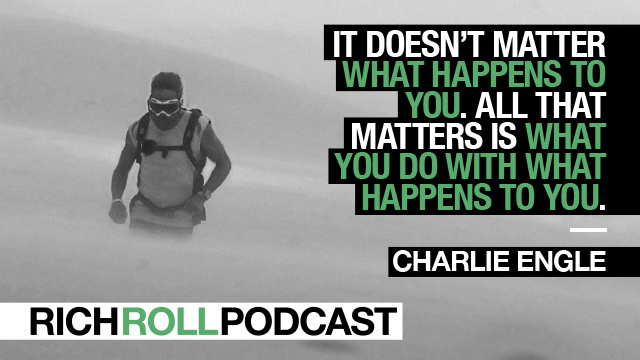 "Running across the Sahara, all 4600 miles, 50 miles a day for 111 consecutive days. That's what Ultrarunner Charlie Engle did to raise 6 million dollars for H20 Africa (now Water.org). In doing so, he took his passion and did good with it." "Take possession of the possibility"
Winner among the "50 RW SELECT" chosen by RUNNERS WORLD MAGAZINE in 2016 - designating the article as one of the 50 BEST EVER PUBLISHED in RUNNERS WORLD MAGAZINE over 50 years! "notorious" ~ Brutal. Terrifying. Inhuman. The organizers of the Barkley Marathons don’t care what you call the toughest trail-running competition in the world, as long as you don’t finish it.